Yet another MuscleHacker gets ripped! This time it’s Dan Cravens – 43 yrs old. Like Armin before him, Dan knows that a six-pack isn’t only for people in their 20’s – that’s a total cop out! 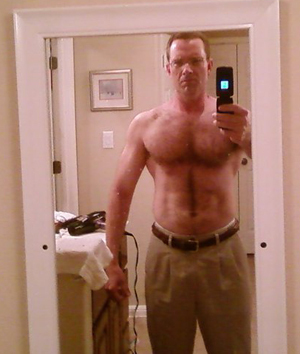 Strangely, 43 year old abs also seem to have to ability to totally floor moms when flexed; we’ll talk about that later! Dan posted his pics on the Facebook group but I wanted to share the testimonial here for anyone who still hasn’t joined up. So Dan wasn’t even following the program to the letter for the first week. He simply started the cutting diet without implementing the full body workout routine. Interesting to note here is that his arms got bigger while losing weight. Furthermore, there was a greater reduction in body fat percentage than you would expect with 10lbs of fat loss. This is explained by the simultaneous muscle gains, which positively impacts your body composition. You can see that his abs are starting to come through a little as well. “Finished TSPA for now, due to the upcoming holidays. I’m very eager to start THT and GLAD, and the arms blast experiment! 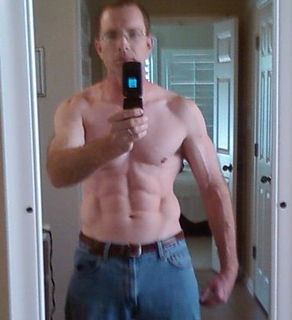 “Being 43 years old with 3 kids, this is the first time I’ve had 6 pack abs and it’s awesome! I told a couple of moms about what I’d been doing, and they insisted on seeing the results. They were floored when I lifted up my shirt and flexed my abs! “Final weight 170.5 lbs, 11% bodyfat. Not only did I lose the fat, but I got considerably stronger in my workouts. I wish I had been there to see the look on those mom’s faces when you whipped out your six-pack! The other thing I love about your results is that it is another example of someone GAINING both strength and muscle mass while SHREDDING unwanted flab! 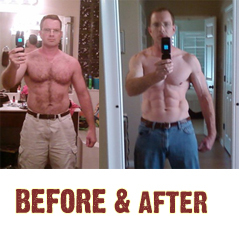 I can’t stress enough that weight loss isn’t what you want, body recomposition is the holy grail, and it CAN be found! In contrast to Shalin’s testimonial, this is an example of someone looking leaner at 11% body fat than you would expect. Going by the after pic, I would have put Dan at anywhere between 8.5-10% body fat. This means that Dan has his fat spread out pretty evenly throughout his body (see before pic), whereas those people who have a tendency to deposit most fat around the gut (including me), typically have to attain lower overall body fat percentages to get ripped abs. So if Dan and I got to exactly 10% body fat and stood side by side, Dan would look more ripped around the midsection then me because I had more to lose from that particular area. While you can’t change where your body decides to deposit your fat, you CAN get rid of it quite quickly and effectively, AND get more muscular in the process! There are more pics of Dan on the Facebook group – go ‘like’ the page if you haven’t already. I hope you enjoy your first Christmas with a six-pack, Dan! Yeah I would put that at lower than 11% too. Congratulations to Dan. Most people are getting fat at this of year, and you’re getting ripped! Just goes to show there is no excuse – just do it as Nike would say! Just check out Armin’s pics too, never seen them before. Really inspirational to me. Can’t say it often enough, but thanks Mark for everything you do for the bodybuilding community!!! Oustanding, Dan! Congrats on your MuscleHack.com debut! Welcome to the club! And he’s exactly right – thanks Mark for everything! It’s you and your approach to making muscle gain and fat loss that makes it so “doable” for everyone. MuscleHack till you drop, everyone! Outstanding results Dan! I saw your pics the other day on facebook and it was very impressive… keep up the good work! The pictures speak for themselves, this system works! As far as my body fat%, I’m using an Accu-measure caliper, my legs show a higher range ~12-14%, chest 8-9%, abs 9-10%. My measurements have been pretty close to what the gym’s measurements have been. I think Adam nailed it, Mark’s approach to fat loss and muscle gain makes it doable for everyone. Rock on! Nicely done, Dan. I’m 33 and doing well using MANS and THT. I’ve been worried that my results will suffer as my body ages, but you’ve proved that a great physique can be attained in your 40’s. Thanks for the inspiration. Great work Dan! This is a tremendous accomplishment. Keep spreading the good word and let me know if you need any help keeping those mom’s at bay!